I jumped to grab this book from Shana. This is a very busy story line and there are a lot of people for reading. This is for adult readers. Lorraine wants to elope to Scotland as her father doesn't like her choice. Major Spoiler! Ewan got the job to keep Francis, his cousin, away from Lorrie. He bothered Ewan since they were children and said Ewan lied. Lorrie is smart to find how to get away to visit Francis. Now there is a series kidnapping in London. The girls get set free after money. Lorrie finds out that Ewan has dialectic reading and hard to talk. Dean is told by his father that he had put money in a deal and lost all their money. Major Spoiler! For all the pain they gave him growing up he will still try to get it back. Lorrie gave up Francis and is talking to Ewan and learns she was grabbed. Ewan has a group of friends to help him! There are other problems around her and Ewan. I liked this book. It was hard to put down. Check out this story! Grab a book to read and fall into like I did! Enjoy your reading! Strong Heroine Meets Quiet Hero! 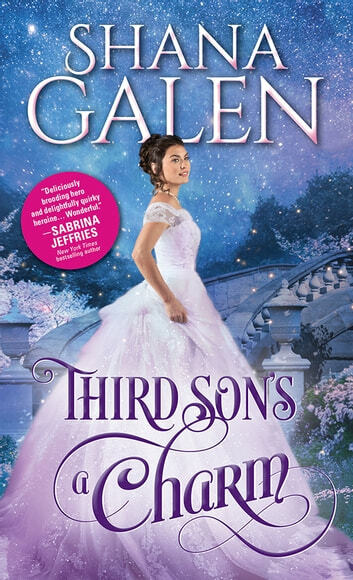 Ms. Galen knows what's appealing to the heart, but sets her sights on stimulating the mind. Third Son's a Charm is a seductive puzzle. Every sense is on high alert. Sizzling attraction puts a mischievous lady and a duty bound soldier on a collision course with romance and intrigue unlike any other. Hidden agendas, secret liaisons and read herrings at every turn make the road treacherous, but no less thrilling. 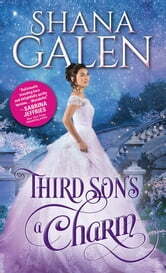 Never malicious but always delicious, Shana Galen is romance on the edge. Exciting, inviting and delighting. Thouroughly enjoyed this story of The Protector, a veteran of the Napoleonic War, and his recovery while coping with the hostility of his titled father and encroaching cousin. Read it straight through to see if he captured the love of the out-of-ordinary Lady he was hired to protect.